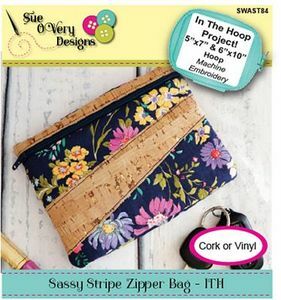 The Sassy Stripe Zipper bag is a wonderful and professional use of non-woven materials such as Cork or Vinyl. It is a perfect use of Cork scraps too only requiring a small strip along the top zipper and then an angled stripe in the center. This zipper bag is finished all in the hoop using an embroidery machine with one hooping. The front features a zipper; the back an extra pocket and the lining is completely finished in the hoop, with no raw edges or exposed seems inside. Simply choose your favorite quilt cotton and coordinating Cork or Vinyl and whip one or two up. Comes in two sizes, small for the 5in x 7in hoop and the large for the 6in x 10in or larger. Bag finished dimensions small 6-3/4in w x 5in t and the large, 10in w x 6in tall, horizontal shape. Add side ring to turn into a wristlet or keep simple. Perfect Cork scrap buster.